There are plenty of things to do on Chincoteague Island. In addition to the unparalleled beauty of tranquil beaches with spectacular sunrises and sunsets, our islands offer diverse wildlife, fantastic woodlands and marshes, scenic water views and wild Chincoteague Ponies. Our mild year-round climate enables continuous enjoyment of numerous activities. Even though there's so much to do in Chincoteague, here are some of our favorites, in no particular order. Looking for a little bit more detail or ideas? Check out our official Chincoteague Visitors Guide. Chincoteague is home to some of the best fresh seafood in the country! From finger-licking crab feasts to wood smoked BBQ, there's a little something for everyone! We recommend checking out some of Chincoteague's ice cream parlors for a real treat to beat the heat! 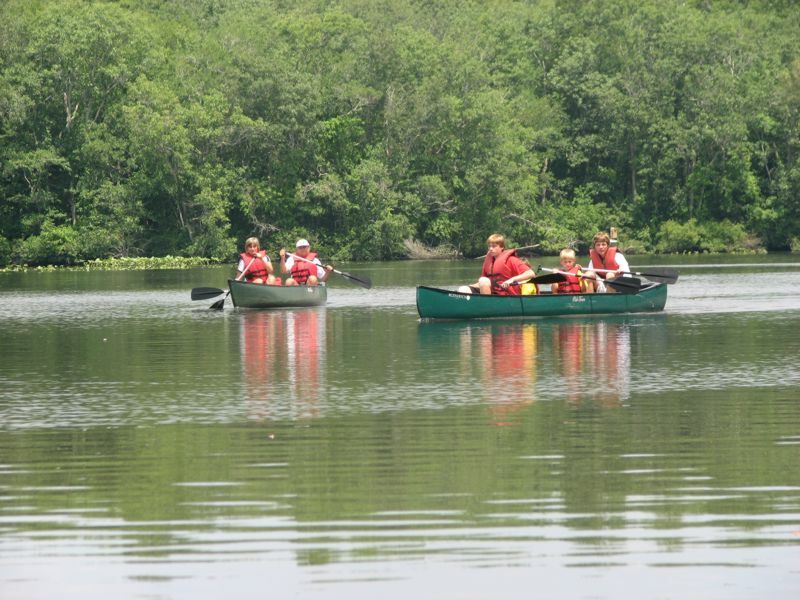 There are so many different ways to take in the natural beauty of Chincoteague! You could rent a bike or hike along wilderness trails- we recommend the Wildlife Refuge.The Seaside Water Trail is fun as well, you can check out kayak & canoe rentals here. The 14,000 acre Chincoteague National Wildlife Refuge also provides an incredible setting for exploring the beach, dunes, marsh, forest, and more. For those more serious about fishing or hunting, these are some of the local favorites for hunting guides and fishing charters. There are plenty of different hunting & fishing packages to choose from, so make sure to take your time when deciding what works best for you! What's a vacation without a little retail therapy? Rain or shine, it's always a good time to explore all of the great shopping in Chincoteague! From small local art boutiques to salons, bookstores and specialty shops, Chincoteague has something to offer every shopper. Chincoteague is known around the world for their ponies and annual Pony Penning and Carnival, which takes place every July. If you're here during the month of July, check out the full calendar of events. Scenic Boat Cruises through the Chincoteague and Assateague Channels provide opportunities for bird watching, pony watching, or just relaxing while watching the sun set over the islands. This is one of our favorite ways to take in the natural beauty of Chincoteague! Are you a lover of photography and nature? Chincoteague is the perfect place to be! Our 14,000 acre Chincoteague National Wildlife Refuge will keep you occupied for weeks! You just might be able snap a shot of one of the 300 different species of migratory birds who spend part of the year here. Some of the birds you might see include: snow geese, waterfowl, wading birds, shorebirds, and song birds. Enjoy breathtaking sunrises from Veteran's Memorial Park on East Side Drive or venture over to watch the view on Assateague Beach. 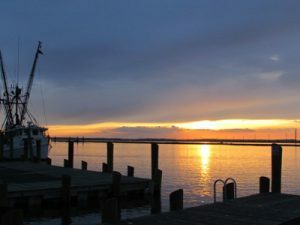 Our beautiful sunsets can be viewed at the Robert Reed Waterfront Park on Main Street in Historic Downtown or the Donald J. Leonard Waterfront Park across from Chincoteague Combined School. See a rocket launch for yourself or visit the NASA Visitor Center to get your astronomical fix! Be sure to check out our best rocket viewing sites on Wallops, Chincoteague & Assateague Islands at the bottom of our NASA guide. Who said you can't learn something while on vacation? These museums cover everything from local history to artifacts from trains and railroads left behind since the mid-1800's. The Chincoteague Blueberry Festival is held each July and is the largest fine arts & crafts event on Virginia's East cost, making it a must for art and blueberry lovers alike. Art not your thing? Check out the Chincoteague Oyster Festival in October or the Chincoteague Seafood Festival in May. In town during the holidays? 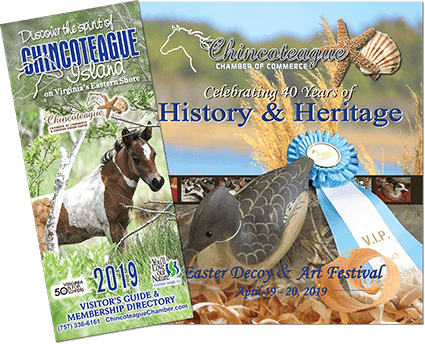 Check out our Chincoteague Old-Fashioned Christmas Parade in early December and the Easter Decoy & Art Festival, which is always held the Friday & Saturday of Easter weekend. Still Looking For Things To Do In Chincoteague? Bonus: Even More Things To Do In Chincoteague! Chincoteague Veteran's Memorial Park is located on East Side Road. The park has tennis courts, basketball courts, playground equipment, fishing/crabbing pier, ball field, boat ramp, skate park, pavilion and restrooms. The pavilion may be reserved for groups through a permit issued by the Town for approval. It is recommended that you contact the Town Office to check availability at (757)336-6519. There is no fee for reserving the pavilion. The Commonwealth of Virginia enforces a recreational fishing license for the water surrounding Chincoteague. The Town of Chincoteague purchases a fishing license for the Veteran's Memorial Park fishing pier, so an individual license is not required. Please check with local bait and tackle shops for fishing license regulations regarding private piers, boats and the regulations for surf fishing on Assateague Island...etc. Robert N. Reed Downtown Waterfront Park on Main Street located in the heart of downtown offers recreational opportunities and sites for festivals and events. There are currently 10 boat slips available for rent to transient boats that are in excess of 26’to 50’ in length. The park is ADA accessible, inclusive of boat slips. 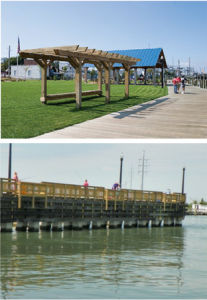 For more information on events and accommodations at the Waterfront Park call the Town Office at 757-336-6519 or contact us via e-mail at: kelly@chincoteague-va.gov . Be sure to bring your fishing pole and cast your line off the new fishing pier (no license required). Donald J. Leonard Park is located on N. Main Street across from the Chincoteague Combined School. It protects an open view of Chincoteague Bay with approximately 600 feet of water frontage. Over 2.7 acres of waterfront land has been left in its natural state for the enjoyment of the citizens and visitors alike. Park facilities allow for off street parking up to 10 cars, picnic tables, and kayak access to the Virginia Seaside Water Trail. This is our pet-friendly park!!! Rep. Depths (MLW): Entry 12 ft. Fuel Dock: NA Max Slip/Moor: 15 ft./0 ft. Slips: 22 Transient slips. Water, fuel; gas non-ethanol, regular and diesel fuel. 24-hour bathrooms and 24-hour security surveillance, pet-friendly and fish cleaning facilities. Vernon Merritt, Harbor Master can be reached anytime at 757-894-1349. Slips: 10 total, 10 Transient Max LOA: 50 ft. Max Beam: 18 ft. Note: There are mosquitoes and gnats on the barrier islands in the summer. Chincoteague sprays for mosquitoes, both from trucks on the ground and from low-flying planes in the summer, so the mosquito population is to some extent controlled. But because Assateague Island is a Refuge for a variety of birds and wildlife, spraying is not a practice there, and a repellent is a summer “must”. Pets: Not allowed on Chincoteague National Wildlife Refuge-not even in vehicles! This includes all of Assateague Island Virginia, the National Seashore and wildlife trails.